Aerial view of Structure Fourteen, taken from Andre’s helicopter. If the morning was bright and breezy, the afternoon brought a pall of cloud, which hung over the site and reflected, to some degree, the mood of those below. The Ness has been such a humming, buzzing hive of activity and noise for so many weeks that, to see the workforce reduced, the departure of the Willamettes and the appearance in force of the planning frames, has brought home the realisation that the end is near, for this year at least. 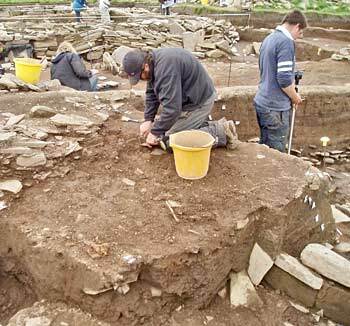 The digging has continued in some areas and visitors have continued to flock to see the site, many of them unaware that this is the last week. Some of them have been genuinely distressed that a friend/relative who will be coming at the weekend/next week will now miss the chance to see the site. And yet more planning in Structure Ten. Among our visitors in the afternoon was a party of local dignitaries including our MSP, Liam McArthur, sundry councillors and officials from various Orkney Islands Council departments etc, and the members of the Orkney Heritage Society. 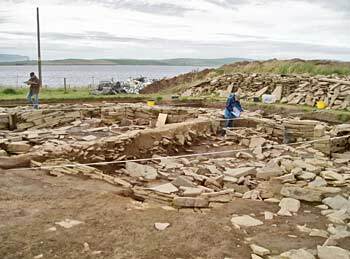 Dr Jane Downes, head of the archaeology department at UHI and Nick gave them all a lengthy, and highly informative, tour of the site before presenting them with copies of articles in distinguished journals featuring the Ness. It was clear from their expressions and comments that many were fascinated by the site, and, in some cases, downright surprised because they had not realised the extent of the archaeology present here. Hopefully, this will result in continued support for the Ness from the council and other supporters. Andy removes the last of the bone spread in his section across the outer pavement around Structure Ten. 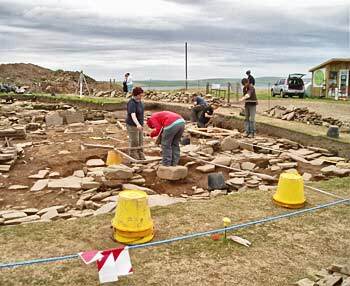 One message that we hope they will take away from their visit is the extraordinary boost to Orkney’s image internationally which publicity about the site has brought. Not to mention the hordes of tourists who have visited us (can you believe our 1,200 visitors on Open Day?) and the benefit to the local economy from all these visitors. 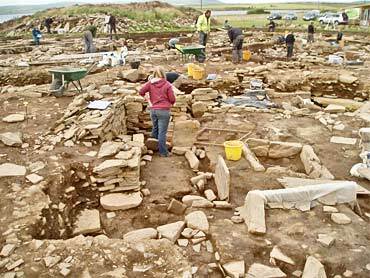 Archaeology is now big business in Orkney. From big business to big pot . . . In the central midden, Sarah is excavating a very large pot base, which is tilted at an angle in the midden. It will certainly not come out in one piece but can, perhaps, be taken out in a block, or perhaps wrapped securely in bandages (see Scott below), before being lifted. It is a wonderful piece of pot and fingers will be crossed tomorrow morning for the lifting. Planning continues in Structure Fourteen. My name is Scott Forsyth. I’m currently studying for a masters in material culture and artefact studies at the University of Glasgow and I’ve spent the last five weeks on the Ness as an assistant in the finds hut to aid me in my studies. Neither of these things bother us too much though, as they are part of the best thing about the finds hut, as well the Ness as a whole, the community that surrounds it. Working here means you’re guaranteed to get a chance to speak to everyone on the dig and a fair few of our more curious visitors too. My average day consists of cataloging finds, laying out new finds to dry and then packing away finds once they are dry. 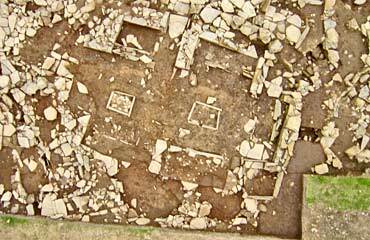 Almost everything on this site will benefit from being dried after it has been taken out the ground, as once clean it’s easier to study decoration on pieces of pottery, to see incised lines on stones, or to see patterns of use on stone tools. On occasion, though, when larger, more intact pots are found, I get to help bandage them up and lift them out whole, keeping them in as good a condition as possible for sending off to conservation. For me personally the best part of working in the finds hut has been the familiarity that handling the finds every day builds up, it’s the kind of experience that could not be replicated by only looking at pictures or seeing objects in museums. And when I do have a question about rock morphology or how a piece of flint was worked, we have experts on site to answer them. I’ve learned a lot these five weeks and it’s thanks to Nick, Ann, and the massive group of people who contribute their time to the Ness, so this is a good opportunity to say, thank you!